Moran Yacht & Ship are now the sole, worldwide central agents for the 16 year-old Heesen superyacht Brazil. The 131ft superyacht underwent an extensive refit in 2008 and Moran confirm that the majority of the work undertaken was internal, focused on interior design. 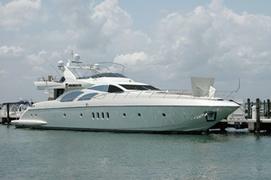 Based in Fort Lauderdale, Brazil has an asking price of US$11.95 million and can accommodate ten guests in five staterooms. Currently lying in Bodrum, Turkey, the 98ft superyacht Obsidian is also for sale with Moran, with an asking price of €3.4 million. Launched in 2004 by Azimut Leonardo, the large, full beam owner’s cabin is located midship and flooded with light from six oval windows, while Obsidian's dining area seats six guests at a round table with wide glass doors giving access to the aft deck.